Whuddafug - ZineWiki - the history and culture of zines, independent media and the small press. Whuddafug is a zine written and published by Anthony Abelaye. Random copies can be found throughout the Dallas/Ft. Worth metroplex. Copies are also available for sale or trade through mail-order. Whuddafug is published sporadically and somewhat haphazardly. 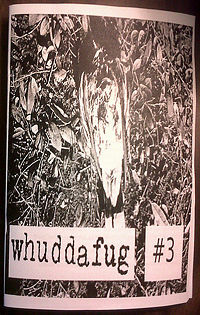 Except for the earliest back issues, you won’t find Whuddafug (the zine) online. It is released in hard-copy format only and distributed to seemingly random places -- laundromats, hospital emergency rooms, commuter trains, or Greyhound bus stations. This page was last modified on 19 February 2011, at 21:43.